Education classes are offered from one to three times per year depending upon demand and teacher availability. Please view our calendar page for the scheduled dates of the classes we are currently offering. 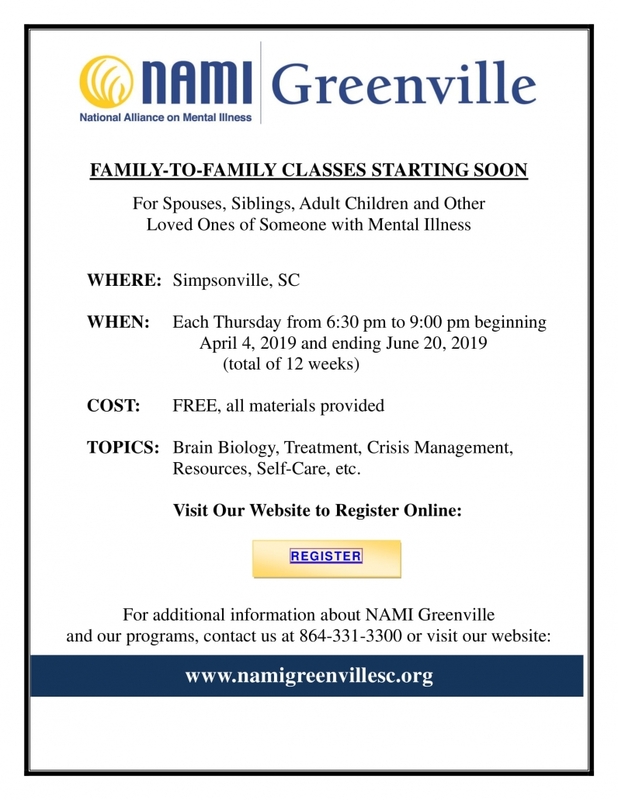 Although education classes are free, pre-registration is required for them through NAMI-Greenville. You can learn more about classes and registration by sending us an email. 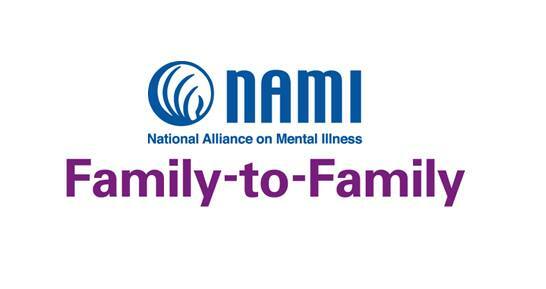 This course consists of a series of 12 classes for families of persons with psychiatric disorders. The course balances basic education about the disorders along with skill training, self-care, emotional support and empowerment. For 1st degree adult relatives only (parents, spouse/significant other, sibling or adult child). 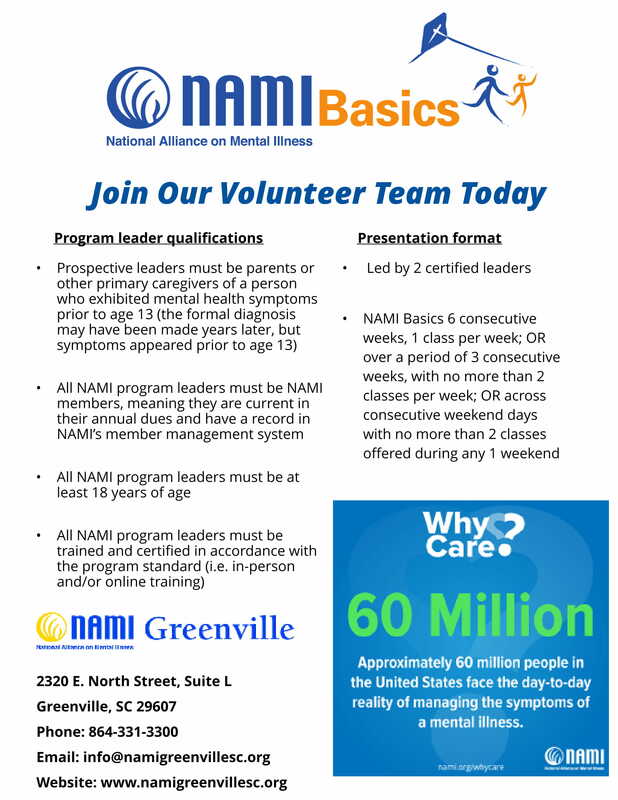 A six-week education program for parents and other caregivers of children and adolescents (up to 21 years of age) living with mental illness. Program provides education concerning diagnosis and symptoms, as well as school issues and support. Through a combination of lecture, interactive exercises and structured group process, this ten-week course addresses the topic of recovery for any person with serious mental illness who is interested in establishing and maintaining wellness. This two-hour presentation for schools is a great program to get teachers to identify children early who are at risk for a mental illness so they can get them on the right track in school to be successful. This Continuing Education Unit Program is designed to educate and prepare law enforcement officers to recognize signs and symptoms of mental illnesses and to respond effectively and appropriately to people who are experiencing a psychiatric crisis. Two people living with mental illness share compelling and personal testimonies of living with and overcoming the challenges posed by mental illness. This program is tailored to 60-90 minutes for churches, civic groups, schools, and other organizations. NAMI Homefront is a free, six-session class for family, friends and significant others of Military Service Members and Veterans. The class helps families comprehend what the Military Service Member/ Veteran is experiencing related to trauma, combat stress, civilian life, PTSD and other mental health conditions. The course is designed to help family members understand and support their Military Service Member or Veteran while maintaining their own well-being. The trained teachers of this course are also military/Veteran families who have a loved one with a mental health condition.